STS 2016 finalists hold up their minor planet certificate. PHOTO COURTESY OF LINDA DOANE FOR SOCIETY FOR SCIENCE & THE PUBLIC. Steven Eastaugh’s 1970 Westinghouse Science Talent Search (STS) class had far fewer female finalists than 2016, which was the first year to have more female than male finalists. “I’m proud this year is the first year there are more women than men [finalists],” said Eastaugh, who was this year’s Science Talent Institute Alumni Speaker on March 10. Steven called himself a Sputnik baby, which is how he became interested in science and medicine. He has had a long career in public policy and healthcare, at one point working in a cubicle next to Carl Sagan. Steven Eastaugh offered advice to STS finalists as the competition began. PHOTO COURTESY OF LINDA DOANE FOR SOCIETY FOR SCIENCE & THE PUBLIC. After helping a fellow STS 1970 finalist avoid being arrested for sitting on the lap of Abraham Lincoln’s statue, Steven discovered instead of strict science, he might have a knack for public policy and diplomacy. Steven encouraged the finalists to constantly push their boundaries and the boundaries of knowledge. Don’t be afraid to approach decision makers and tell them about the way policies should go, he said. The finalists should think big and consider how to create system-wide change. Steven took risks during the summers he worked in labs. For several summers, he studied astrophysics. One summer, he switched to nuclear physics. “I could have stayed in one subject, but I drifted,” he said. While the finalists are working on their careers, they should also teach others about science and give back, he said. Steven also viewed bias and certainty as enemies of science. 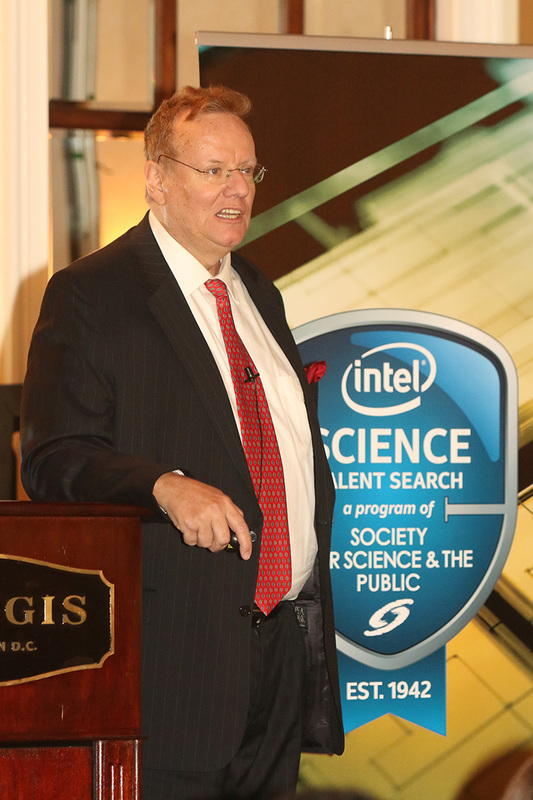 He believes Intel STS alumni should be involved in educating leaders and the public. “We can’t just try to educate the public and hope it trickles down to politicians,” he said. Maya Ajmera, the President & CEO of the Society and publisher of Science News asked finalists to raise their hands if they also participated in Broadcom MASTERS or Intel ISEF competitions. Broadcom MASTERS is a middle school competition and the Intel International Science and Engineering Fair is an international high school competition, both owned and run by the Society. Several Intel STS 2016 finalists participated in two competitions, or all three. “We have trifectas going on, which is very cool,” she said. Dr. Grant Stokes announced that STS 2016 finalists would receive a minor planet named after them. PHOTO COURTESY OF SOCIETY FOR SCIENCE & THE PUBLIC/MARLENA CHERTOCK. After Steven’s speech, Dr. Grant Stokes, a 1977 STS finalist and 1976 ISEF finalist, announced that the Intel STS 2016 finalists will have a minor planet named after them. “This is the biggest piece of real estate you’re ever going to own,” he said. There was an audible gasp among the finalists when they learned the news. Read about an Intel STS finalist who hunts exoplanets in the center of our galaxy.